The Dunlop FFM3 or Dunlop Fuzz Face Mini 3 has been Attila Wind's main fuzz pedal since 20 December 2016. Wind chose the Dunlop FFM3 to recreate his old-time favorite sound heard on Pink Floyd's Live in Pompeii and The Dark Side of the Moon. On Gilmoursh Bjørn Riis wrote that Dunlop FFM3 is a "faithful clone of the 1969-70 Hendrix era Dallas Arbiter Fuzz Face with the BC108 silicon transistors, a handwired brown circuit board and the classic looking hammertone chassis. Of all the current Dunlop reissues and signature models, this is the most vintage sounding, with an open and dynamic tone, lots of gain and a well balanced frequency spectrum". The Fuzz Face Mini pedal line features legendary Fuzz Face tones in smaller, more pedalboard-friendly housings with several modern appointments: a bright status LED, an AC power jack and a convenient battery door. 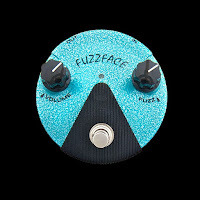 As with the original models, Fuzz Face Minis feature true bypass switching. The FFM3 Jimi Hendrix Fuzz Face Mini Distortion has the same circuit as the JHF1 in smaller housing, delivering the thick, smooth Fuzz Face tone that Jimi Hendrix made famous in a pedalboard-friendly size. The Jimi Hendrix Fuzz Face Mini faithfully recreates the sound of the JHF1, itself a faithful reproduction of Jimi’s Dallas Arbiter Fuzz Face. These pedals are built around the BC108 silicon transistor, a legendary component if ever there was one. The vintage Fuzz Face is something of a giant – measuring 7” in diameter, a pedal that eats up your board space. Dunlop solved that by shrinking the enclosure down by half, which means you’ve got room for another pedal now. Dunlop also brought the Fuzz Face Mini into the modern day by adding true bypass wiring and an LED indicator so you always know when the pedal is engaged or in bypass. Finally, Dunlop added a 9vDC power jack, so now you can finally run your fuzz from a power supply instead of a battery (though for purists—there’s still a battery compartment!). Jimi’s tone is legendary for a reason—it’s now more accessible than ever!